Egypt gets a bad rap. Sure there are some things you need to be wary of. But this is true for anywhere you travel in the world. We have wanted to go to Egypt for years, and Cairo (its largest and most famous city) was worth the wait. And so we want to share with you our highlights of Cairo. We saw many things on our Nile cruise that were so ancient it boggled the mind. And then we come to Cairo and see things that are 1500-2000 years older. Construction on the oldest pyramid in Giza started around 2589 BC. When I was in fifth grade we studied Egypt. It was as early as this, and even earlier, that I knew I had the travel bug. My love for history and cultural studies began early. And finally at age 58 I stood at, touched, climbed and admired these overwhelming structures. The best known pyramids in Egypt are the three in Giza, a suburb of Cairo. The three Egyptian pyramids known as the Giza Pyramids are Khufu, Khafre and Menkaure. Khufu is one of the largest structures ever built and is the only one of the Seven Wonders of the Ancient World still in existence. Egyptologists believe the pyramid was built as a tomb for the Fourth Dynasty Egyptian pharaoh Khufu. There are a total of 138 pyramids throughout Egypt, most built as tombs. There was no city here when the pyramids were built. The city has risen up and is now a congested metropolis of 30 million people (and nearly that many cars). The city spreads far and wide and right up to the gates of the UNESCO site. Most photos don’t show the city because the pyramid site sits up on a hill. But the city and its traffic are within a few hundred meters of the pyramids. Because the pyramids are such a huge tourism draw, while visiting you are subjected to a lot of people trying to sell you, guide you or take you on a tour. The government should do a better job controlling this – it takes away from the experience. Having our guide from Memphis Tours eliminated much of the hassle of dealing with the nuisance. display) and will replace the 100-year-old (and somewhat dowdy, disorganized, and not particularly clean) Museum of Egyptian Antiquities. This new museum alone is worth a return visit to Cairo. Our Cairo highlights tour also included the Sphinx of course, a fantastic antiquity in itself. The Great Sphinx built in approximately 2500 BC for the pharaoh Khafra, the builder of the Second Pyramid at Giza. The sphinx was carved into the bedrock of the plateau, which also served as a quarry for the stone for the pyramid. It is 70 meters long and 20 meters high. Luckily we were there early and had the sphinx all to ourselves for our visit. What a special treat that was. 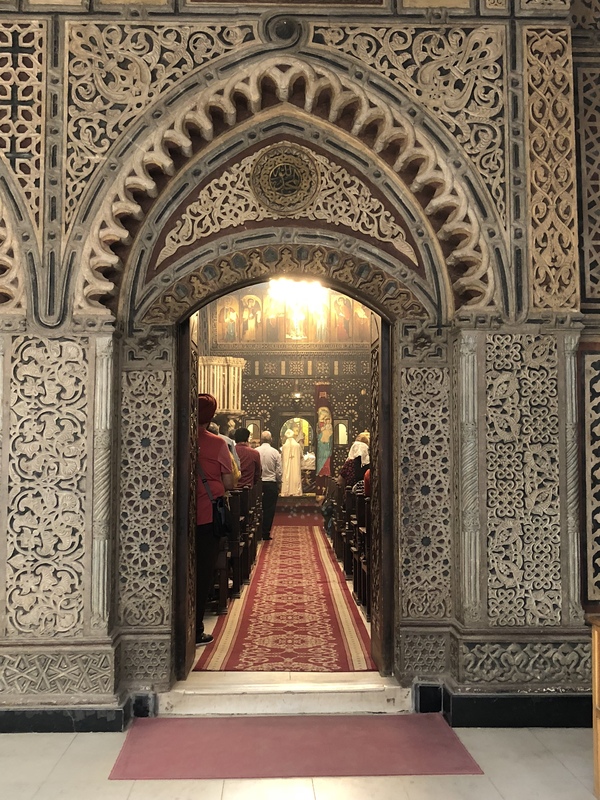 We made a brief stop in the Coptic Cairo neighborhood, an ancient christian stronghold of Cairo before the Islamic era. A visit to Key of Life Papyrus Institute taught us the ancient Egyptian paper making process from papyrus (a reed-like plant), and gave us an opportunity to purchase a Christmas gift. We also visited a local market and had a delicious Egyptian lunch at Abu Shakra, a favorite of tour guides because of the remarkable view of he pyramids and the sphinx. I highly recommend you hire a guide and driver if you are coming to Cairo (Memphis Tours was outstanding) to help you maneuver this congested city as well as help you mitigate the numerous people trying to sell to you and guide you. It is well worth booking a guide service. I would come here again in a heartbeat. In fact I’d love to come back in five years and see the new museum and see if they have been able to make some improvements to the Giza area, which is in much need of some TLC. Thank you Egypt and Cairo for your outstanding hospitality. We loved it all. Next stop Jordan! Namibia quickly became one of my favorite countries for its varied landscape, colorful cultures and interesting history. So although I did not see the entire country, Namibia Part II is an opportunity for me to share a bit about what I saw and learned during my fascinating ten days touring with Wild Wind Safaris. Namibia Part II – Oh the Places You’ll Go. Only a few years ago Namibia never showed up in articles or blogs about travel destinations. But then all of the sudden there it was – stunning photos of dunes and mountains, animals and oceans. Article after article listing it as a must see destination of 2017 or an out of the way place to see before the crowds of tourists discover it. The furthest south latitude at which the sun is directly overhead at the solstice. And so, I wanted to be there. I wanted to see what few people had yet seen. Namibia was high on my list. Don’t get me wrong – there are plenty of tourists, and plenty of tour operators and companies to help you find your way (check out the company we used and were so happy with: Wild Wind Safaris). But we didn’t meet any other Americans, and 99% of the tourists we met were German. Germans know about this place and flock here, partly because German is spoken here as is English, Afrikaans and tribal languages. National Park and it is a must of any visit to Namibia (see blog here). Etosha is not even remotely as crowded as the safari I did seven years ago in the Serengeti with about a million other people. Etosha was quiet and beautiful and amazing. But a trip to Namibia really needs to include time to see and experience more than Etosha. I’ve come away from the country with an even greater appreciation of the remarkable geology of our earth, and an incredible insight to the importance of preserving cultures and not just objects and nature. Until 1990 Namibia was part of South Africa (and from 1884 until after WWI it was a German colony). Gaining its independence the country has embraced tourism but being such a new country it still has its share of problems. Like many places we have been, government corruption takes much away from the average person and tribal cultures suffer. But the roads were remarkably good (even though Namibia has the highest car accident death rate in the world) and the people we met (mostly in the service industry) were incredibly friendly both with each other and us. In fact some of the friendliest and most genuine people we have met anywhere in our travels are the Namibians. That really hit home. We never felt like we were unsafe or being cheated in anyway – although warnings of pick pockets we took seriously. Namibia has 13 ethnic groups scattered about the country and the native people identify with an ancestral tribe even if they no longer live in the region where that group is. Our amazing tour guide “Seven” explained to us some of the differences and he could look at nearly every person and know immediately what ethnic group they were from. Since we didn’t see the entire country we missed learning about most tribes, including the Owambo of the north, the tribe Seven is from. We did get to learn about two distinctive tribes – the Himba and the Damara as well as a little bit about the Herero, an offshoot of the Himba. One of my favorite experiences of the entire ten days was our short visit to a special Himba village where we were able to meet Himba women and children. Note the photos of these remarkable people. These are not costumes. This is the way they dress everyday. The hair style is really remarkable, and a female Himba begins wearing this hairstyle at puberty. The adornments are made partially of their real hair and animal hair and are updated every three months. Because of the shortage of water in the north of Namibia where the Himba people are found, they do not bath with water. Instead they daily “wash” their hair with smoke – literally holding their head as well as their underarms over a special perfumed smoke (similar to incense) that keeps bugs and (most) odor away. They also cover their bodies daily with a mixture of butter and ochre as a cleanser and repellant, this is what lends the red tone to their skin. The village we visited was a special place because all the children here are orphans. This is a place where Himba orphans are brought to be raised in the culture of their parents rather than being adopted out of the culture. The women here care for these children as if they are their own and there is a school here too. The people are sustained by raising goats and cattle and they have access to a well so water is available but their bathing customs remain the same. As we visited the women let us take photos and then they wanted to look at the photos on our phones. They seem to very much like to see themselves in a photo. The women’s first question to us was if we had children. When we said we had grown sons they wanted to know if we had grandchildren. When I said not yet they wanted to know why not? Why had we not yet chosen wives for our sons? My answer that our sons would hopefully marry someday and have kids didn’t seem to satisfy them. Their entire existence and culture is wrapped around family, child-bearing and daily survival. Once again I am reminded of how many people live every day hand to mouth. killed. Luckily not all were massacred and today the women have developed a very unique dress that is a unique mix of Victorian gown and petticoat and a unique cloth headpiece that is designed to resemble the horns of a cow. Today the Herero people continue a battle in court with the German government for retribution for all they lost during the genocide period. sheepskins. The women use ochre on their cheeks much like we use blush today. Music and dance and making ornamental jewelry and carvings were a big part of their culture, where the women did domestic chores and the men tended the livestock. The geology and scenery of Namibia is as diverse as its ancient people. The incredibly beautiful red sand dunes of the Sossusvlei region are the oldest dunes in the world and the stark beauty of these dunes is remarkable. The turquoise blue water of the Atlantic Ocean at Swakopmund in contrast provides visitors and locals a cool get-away from the heat of the interior. Here on the Atlantic the fog settles every day and so do thousands and thousands of fur seals, flamingoes and other shore birds. Local seafood is a treat including the KingKlip and Kabaljou two of the most popular and most delicious fish caught locally and served everywhere. From the ocean heading east within minutes you are back in the arid desert where the welwitschia plant grows – the only region in the world this unusual plant is found and growing as big as ten feet across and living as much as 2000 years I was reminded of Audrey Two in Little Shop of Horrors. The inhospitable environment has little greenery and almost no animals except birds. The valley of the moon and eroding mountain range are desolate yet beautiful in their own way – especially the interesting dolerite dike a natural phenomenon of black sunburnt rock that runs along the ridge of the mountains like the spine of a dragon. This area is home to the largest Uranium mine in the world. Namibia’s storage hunter-gatherers and Bushman (San) people were nomadic and traveled the country wherever the animals were. Their history is written on stones in several regions and we visited two fascinating sights to learn more. The Twyfelfontein site is today a UNESCO Heritage site in the Kuene region. Guides take visitors on a walking tour of the hundreds of rock etchings estimated to be several thousands of years old. The etchings depict animals as well as human footprints and tell a story of the nomad life and the animals they followed for substenance. It is thought this place was both a message board and a spiritual gathering place for thousands of years. Even more amazing though was the preserved painting of “The White Lady” estimated to be 6000 years old. This painting is located in a very remote region of the Brandberg Mountain, Namibia’s highest mountain. It is a two mile hike to visit it. Not as many people see The White Lady because the trek and the heat make it difficult. I’m glad we endured it however in 100 degree temperatures. Very different than the rock etchings, these paintings are preserved because they are inside a cave and out of direct sunlight. Discovered in 1918 and now a protected heritage site, the White Lady is actually not a lady at all. Early anthropologists believed it to be an Egyptian women, but today archeologist know it is a local tribal shaman, painted with the traditional white a shaman would have on his legs and body from dust and mud. The painting includes other human figures and many animals all painted with ochre (red), egg, animals oils, charcoal and blood. The painting has luckily withstood the test of time, although since its discovery humans have touched it and thrown liquid on it to try and see it better and this has deteriorated it. Today though it is protected and can only be reached with a guide who makes sure no one does any damage to it. It was a beautiful and remarkable world heritage site to enjoy. The Namibian people have a great deal to be proud of and I hope this beautiful country overcomes its problems and finds its strength in the world. It has so much to offer, charm and beauty, history and culture. I will never forget my time here and I can say with all seriousness it is by far my favorite African country of the seven I have been to. Thank you Namibia. Thank you Wild Wind Safaris. Thank you Seven for showing us your remarkable home. I know only three people who have been to this country. I wasn’t sure what to expect but I was open to the adventure I thought it would provide. And I was not disappointed. Only lightly touched by tourism, Namibia is an astonishingly beautiful place and if you have the means you should see it now – because it will change. It always does. There is so much to share about our ten days here, so I’ve decided two blogs are in order and I am starting with the most obvious and most well-known topic of Namibia – the Etosha National Park and the safari we did there. Why did the giraffe cross the road? I did a safari seven years ago in Tanzania with my son and sister, but this was a first for Arne and I really worried he might not get to see all the “big game” safaris are known for; elephants, zebras, lions, giraffes, rhinoceros. I needn’t have worried. Yes, we saw all of those and much, much more. plants and geology, politics and population, and of course knew facts about animals and wildlife I would never possibly have known. I highly recommend both Seven and Wild Wind Safaris if you want a great experience in Namibia. So this tour was an anniversary gift to ourselves and although definitely more than our usual $200 a day budget, it was worth every penny. The animals in Etosha National Park are varied and abundant. The park has supplemented the natural watering holes around Etosha with some manmade ones, providing constant water in this arid and hot environment. This way the animals stay within the park boundaries and are protected and visible to the guests. horns which are then smuggled and sold in the Chinese market. Although this is entirely illegal it is still a problem Namibia struggles with. In fact park officials regularly sedate and cut off the horns of the animals to keep the poachers from killing them. The horns grow back and are made of a material similar to fingernails so it doesn’t cause the animal pain. game on the menu. Oryx is very popular and tastes just like beef. With Seven’s guidance we spent our early morning searching for animals – a great time of day for successful sightings. We then would return to the lodge and relax, maybe take a nap or lay around the pool, before heading out again for a late afternoon game drive. You are not allowed to get out of the vehicle for any reason within the park, so having just Arne and I in the vehicle with Seven gave us lots of ability to view the wildlife and go everywhere in the park. ignoring all the animals they usually hunt in the area. They were intent on one thing. Mom. She lay about 30 yards ahead of us on the road. We positioned ourselves and watched in anticipation as the playful and loving reunion took place. The boys happy to be back from whatever adventure they had been on – back with mommy. This same family we saw several times after that with the magnificent full-maned father (shown in the title photo) proudly watching over his pride. We watched the mating process (in fact got it on video) and these animals truly seemed like a family. We saw many lions during the rest of our visit but other “cats” were elusive, until one afternoon. joy! “That’s a leopard!” he nearly yelled. “Oh my god a leopard and we are the only ones here at the watering hole!” What a great moment that was. The leopard, though too far to get a really good photo of, was so well camouflaged I couldn’t believe it. He took his time drinking his fill and then quietly disappeared back into the brush. Only then did the rhino return to enjoy his own cool drink. A very rare sighting indeed. Spotting the endangered Black Rhino was one of my goals as this animal had eluded me when I was in Tanzania. We actually saw many rhinos during our time in Etosha and they are huge, magnificent and very pre-historic looking creatures. But two special moments stand out. rhino very close to the road. He didn’t like being surprised and he charged our car. I’ll never forget the look on that gigantic creatures face as he lowered his head and charged, while Seven put the car in reverse and I fumbled to get my seatbelt on. He snorted and stared us down but never actually hit the car. Not an animal you want to mess with. Seven told us because he had his head down and was feeding as we came around the corner we had frightened him. Also, because of the poachers these intelligent animals have learned to be wary of vehicles and being snuck up on. Later that night Arne and I went to the watering hole near our lodge. This hole is designed with night vision lighting that does not bother the animals, but allows people to view the animals from seats at a distance. Every night we went to see what was happening at the watering hole, and on this special night a mama rhino arrived with a teeny little baby. Watching the two of them, never more than a few inches from each other, was a special sight. For as important as water is to all these animals, watching the effort it takes a giraffe to have a long cool drink is astonishing. Giraffes cannot hold their head down for very long because it cuts off their blood flow. It also puts them in a very vulnerable position to predators, so a giraffe takes a long time to consider its surrounding before finally spreading its long and skinny legs wide and dipping its camel-like face into the water. What a strange and beautiful beast. white elephants as the sun set looking just like a white concrete statue. One evening we arrived at the watering hole to find two males – one much older than the other. We watched as the younger male began vocalizing as the matriarchal group made its way out of the trees. The older male took this as his cue to exit right, while the younger male greeted both vocally and physically each female as she came near the water hole. The younger male, clearly part of this family, then left the females and youngsters to enjoy the water as he went on his way. On another evening at the watering hole we watched a small fox running across the sand directly towards a giant elephant drinking. As the fox neared the feet of the elephant he reared up and sprayed water all over the fox – clearly showing who is the boss. The poor little fox scampered away. little group was a joyful and satisfying way to end our time in Etosha. This blog was long, but we had such a great experience in Etosha and in Namibia. I hope you enjoyed reading about it. I’ll be writing more soon, about the people and places of this unique country, but in the meantime, the lion sleeps tonight. One month in Morocco has been marvelous. We have seen so very much, and still there is much to see – so we will return one day. But for now, I am so happy to have experienced this magical and friendly country – especially the past five days as we have traversed the diverse geography from Fes to Marrakesh. would find difficult to reach on our own – and I am so glad we did. Our fantastic guide Abdul from Your Morocco Tours was amazing(5 days only $250 per person). He safely drove us for five days and was funny, interesting and proud of his country and his heritage. Have I mentioned how friendly everyone is? the date palm trees made me feel I was part of a movie set. Have I mentioned how great all the roads are? After a long day of driving we arrived in the desert, just in time for a spectacular sunset over the Sahara. It was breathtaking. I didn’t want it to end. Awash in orange from sand to sky it was spectacular. and a good nights sleep. A more leisurely day was on hand for Sunday and after breakfast we climbed the dunes and shopped for scarfs in the town of Merzouga. We then enjoyed a visit to the village of Kamila where we sipped mint tea and listened to the authentic Gnaoua music of the region performed by the ancestors of the original Sudanese slaves who were brought here five hundred years ago. Their efforts to preserve their culture and music are commendable and we danced and had a great time with them. Have I mentioned that this country, more than any other, is where I want to buy things – pottery, rugs, leather? I am restraining myself. Late in the afternoon we arrived at the staging area for our camel trek into the desert. To be completely accurate it’s actually a dromedary trek. Camels are the beasts with two humps. The animals with one hump are technically dromedaries, but everyone calls them camels so, hey, whatever! I wasn’t really sure how this was going to go – was it scary? Painful? Smelly? Actually, it was a teeny bit painful – but mostly just fun. The dromedaries were not smelly, they didn’t spit or bite, but once you are sitting up on one, you realize this ain’t no horse. Wow. They lumber along and your leg muscles feel the movement, but honestly the next day it was my arms that were sore, from trying to hold on when the camel goes down a hill, or sits down. There were ten of us riding and after an hour and half on the camel, including a stop to watch another spectacular Sahara sunset, we arrived at the nomad camp. We were assigned tents with beds and served tea while we waited for another group of 18 to arrive. When they did we all had dinner together (tagine) and then a bonfire and music around the fire. By this time the temperature had plummeted and we put all our clothes on including wool socks and hats and snuggled under the covers for the night. Have I mentioned there are more stars in the sky in Morocco? Billions. Wake up at 6am and you immediately feel the pain in your legs (and crotch) and arms. Yikes. But back on the camel we go, even before I get a cup of coffee. Ugh. I was hoping my camel knew the way to the nearest Starbucks, but instead he took us out of camp into the dunes to watch the sunrise. Surreal. And way better than Starbucks. After the sunrise and a thousand more photos we were back in the saddle and headed back to town, where we were served a nice breakfast (with plenty of coffee) and had a hot shower before we reconnected with our guide Abdul and began day three of our tour. Atlas mountains 300 years ago. Have I mentioned how diverse the geography is? From ocean to desert to mountains to rivers to lakes. Finally we arrived in the Dades Gorge, another amazing marvel of Mother Nature, where our hotel for the night was perched on a cliff overlooking the valley below. We enjoyed an authentic Moroccan couscous meal and met a nice couple from Seattle and swapped stories before a good nights sleep. more ancient Kasbahs perched in the Dades Gorge and throughout the red rock region and stopped to view the geological wonder called Monkey’s Feet. A geology uplift of rock that is unique to this area and impossible to describe. And yes, it did look a bit like the bottom of a monkey’s foot. Midday we visited one of the best preserved Kasbahs in Morocco, the Amerhidil – built-in the 17th century and in remarkable condition. Given that most of this construction is made from mud and straw bricks, finding well-preserved ones of this age is unusual. We toured the building, ate a delicious lunch of grilled turkey kebab and then headed on our way to our hotel. This night we stayed in another very beautiful boutique hotel with exceptional customer service. Everywhere we go the people are so kind and helpful and that is the case at Riad Tama. Big rooms, and a beautiful garden and a lovely restaurant where we enjoyed a a French inspired dinner. Have I mentioned a Dar is a house, a Riad means garden but is often used to refer to a hotel or house with a garden? famous and well-preserved Kasar of Air Ben Haddou where we spent a couple of hours walking with an incredible guide who had been raised in this village. Morocco has a big film industry and this place is one that is often featured in many films including Lawrence of Arabia, Gladiator, and Jewel of the Nile. Have I mentioned a kasbah is a house of a rich family usually with four towers while a kasar is a fortified village with more than one kasbah? All together and a wonderful time. drive with surprising scenery and geography over the Tizi Tichka Pass to the famous city of Marrakesh – our final stop of our Morocco adventure. We will be in Marrakesh for three days. We loved our tour! An inspiring experience in a magical place. In the future when I think of Morocco I will certainly remember the cities we have visited (Casablanca, Chefchaouen, Tangier, Asilah, Fes and Marrakesh) but I think it will be the rural areas I will remember most fondly. The desert is such a special place to be, and to be able to sleep there and see the stars at night and ride the camels – unforgettable. The gorges and red rocks and Kasbahs of old are like something out of a movie set (and some are) but they are real. And beautiful. And cherished by the wonderful Moroccan people. Five Days from Fes to Marrakesh. What an experience. What a lucky girl. What a life.